Tosoh Bioscience's AIA-2000, a fully automated immunoassay analyzer has become the new global standard for speed and reliability amongst fully featured immunoassay analyzers. Equipped with a complete line of test menu, the user can load up to 960 tests (48 trays x 20 tests) in a new, easy-to-load hybrid sorter; increasing walkaway time to approximately 4 hours. In order to prevent potential carryover disposable tips are used with a loading capacity of 576 tips to increase walkaway time. The AIA-2000 delivers 200 tests / hour including true STAT results in less than 20 minutes per patient, making it an ideal solution for laboratories with high workload. Tosoh Bioscience's AIA-2000 has been designed to increase workflow and minimize labor time. 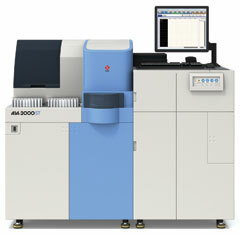 AIA-2000 is capable of handling 200 to 800 tests/day.